As a result of work, review obligations, and some unfortunate lost save files, I have played through the first major island of Risen 2 five times. 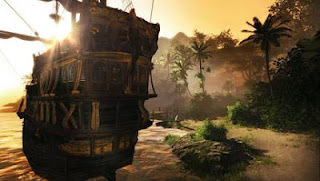 Tacarigua, an island of pirates, giant crabs, wild boars, escaped slaves, and enough fetch quests to make a a player sick after just two playthroughs. My familiarity with the geography of this island and all the quests it hides in its coves and jungle has removed all my natural enjoyment with this initial section of the game and replaced with an entirely different form of appreciation. See, I just cannot approach Tacarigua with eyes anew. Every conversation feels rehearsed in a way it never felt on my first playthrough. The land itself has become so predictable that I feel as though I constructed myself with lego blocks. The island has become a clearly designed piece of architecture. Scott frequently mentions a tendency to view games as though they were wireframes, transparent pieces of design in which he plays. I imagine my feelings towards Tacarigua are much the same. There is a particular cave just off the beaten path that hides an enemy players will have a hard time killing at low level. A glint of light makes it a tantalizing place to explore, but it also clearly to the side and around the corner of one’s intended destination. Weeds grow high around it and now, after seeing most of the island this many times, it seems clearly marked as dangerous territory. Five times through, the entire island is dotted with traffic signs. Of course I have played a few games multiple times in the past. Ico and Shadow of the Colossus I worked my way through several times at least, and I am just familiar with the rocks and plains of those games as I am with Tacarigua. Of course, at least thus far, those two games are far more compelling than Risen 2. Also, I tend to separate my playthrough with a year or two. So while I can appreciate the island of pirates with a newfound appreciation of its more subtle touches, I have also grown so very tired of the same damn missions. My thoughts on this one island have been colored by my extended stay. But once my boat leaves its harbor for the last time, the shores of as yet unexplored terrain become that much more exciting.